The only TKy photo known to me is that of TKy 203, taken by Tadeusz Suchorolski on June 26, 1970, in Warsaw; the engine is obviously in a poor condition. Source: Koleje Piaskowe vol. II – see References. Side drawing from Baureihe 95 – see References. Another picture of the Borsig 8395/1913, as No. 1 of its original user. Source: Die Lokomotive February 1923. The 1-5-0 axle arrangement was very popular in Europe with heavy freight locomotives. However, probably the only European tank Decapods were three heavy freighters, built in 1913 for an Upper Silesian company with a somewhat lengthy name of Sandbahn-Gesellschaft der Gräflich von Ballestrem’schen und A. Borsig’schen Steinkohlenwerke. This company was a division of a large enterprise, owned jointly by the Ballestrem family and Borsig locomotive works, which operated several collieries and had to provide transportation of filling materials from sand pits. For this purpose, powerful locomotives were needed; ability to run on tracks of not necessarily good quality, with steep gradients and tight curves, was mandatory. These locomotives, built – not unexpectedly – by Borsig were numbered 1 (8395/1913), 2 (8396/1913) and 3 (8397/1913); No.2 was given an individual name ‘Adolf Märklin’. They were powerful for their time, but axle load of 17 tonnes was high by current standards. 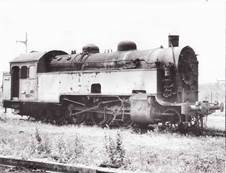 Despite being operated on rather short lines between sand pits and collieries, they had to be coaled frequently, due to modest coal-box capacity of just 3 tonnes and high consumption. All three examples remained in use until 1945 and after the war were taken over by Polish authorities. Due to their axle arrangement they were classed TKy. No.1 became TKy 203; it was operated by Kotlarnia sand pit and later transferred to the Siekierki power plant in Warsaw, where it survived until 1971. No.2, re-numbered TKy 201, was initially taken over by the Jastrzębie colliery and later by ZTKiGK Boguszowice filling materials enterprise. No.3 became TKy 202 and initially went to Kotlarnia; later it was taken over by the Miechowice colliery. Withdrawal dated of the last two engines are not known, but none has been preserved. In some sources numerical designations are given with dash, e.g. TKy-201. 1-5-0 tank locomotives from Borsig were further developed into even more powerful 1-5-1s, built for the Halberstadt-Blankenburger Eisenbahn and known as Tierklasse. These, in turn, served as a basis for KPEV class T20 (later DRG class 95) and several locomotives built for Silesian sand railways. The latter served in Poland after 1945 as class TKz and are described under a separate entry.